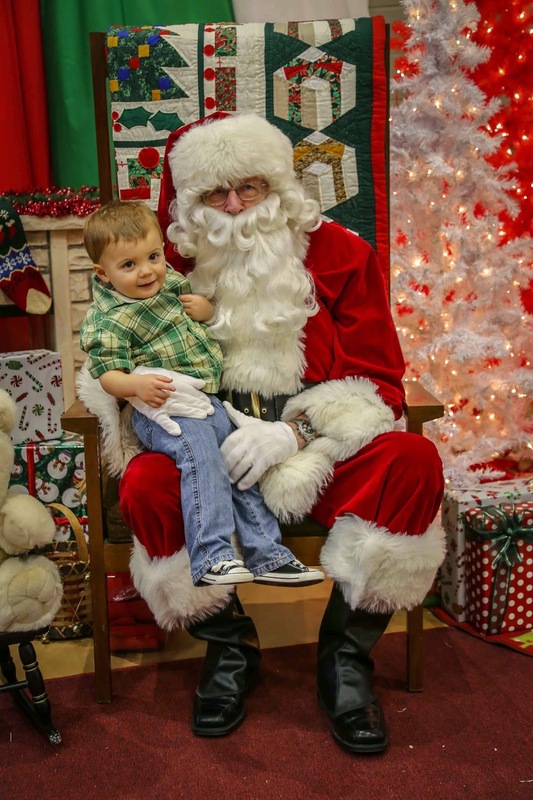 This past weekend we took Patrick to have breakfast with Santa at my school. I was not sure how this was going to go down; he had a successful 2nd visit with Santa earlier last week, but wasn't sure how he'd do again seeing the big man and then with all of the other kids and people there as well. We decided to partake in the breakfast portion (all you can eat pancakes and sausage!) first, and he LOVED that. 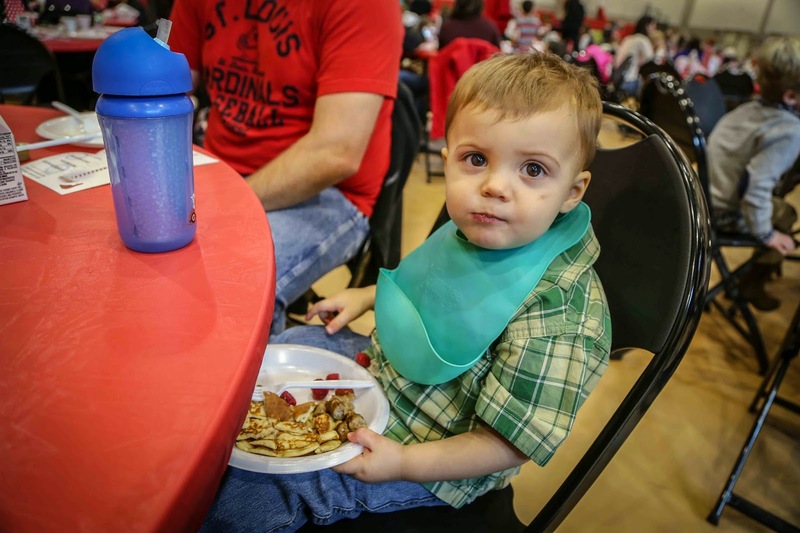 Although there were no high chairs or anything there, and a certain someone refused to keep his plate on the table (I kinda don't blame him, it was way high) so sat and ate all of his pancakes and sausage and fruit on his lap (and shockingly didn't spill a thing!). After that, we decided to go see Santa. Patrick literally was being held back by Mike because he wanted nothing more than to run up to Santa and sit on his lap. It was adorable. Finally, when it was his turn, we let him run up to him and he LOVED it. Santa pulled him on his lap and he again just hammed up his visit with the big guy. So.darn.cute. 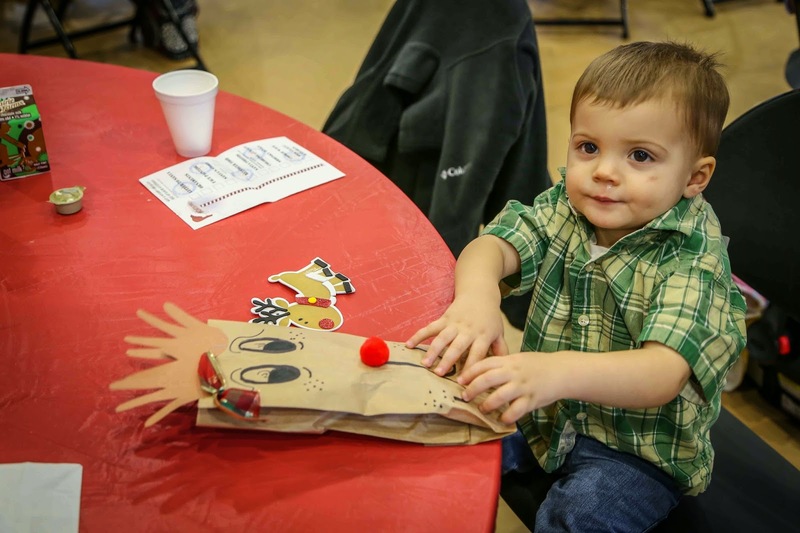 After seeing Santa, we went and did a few crafts (homemade ornaments, reindeer food, etc...) with Patrick before he decided that running around the gigantic gym was more fun than sitting and having his hand traced for reindeer ears. We didn't stay too much longer after that (again, getting close to someone's nap time!) but I think he had a really good time. He may have been a smidgen too young for a lot of the crafts and such, but I think he liked the pancakes and getting to see Santa again...so we'll probably make this a yearly thing, and I'm sure he'll enjoy it more and more each year as he gets older. Plus, it was fun seeing some of my students working the craft booths and such--they love seeing pictures of Patrick so many of them loved meeting him in person!